I can’t tell you how many twists and turns we’ve had on this trip. Some have been good, some have been bad, but all of them have been unexpected. One of our families favorite movies is Dan in Real Life. We can all quote most of it. One adage from the film is: "prepare to be surprised." The very reason for this current road trip was unexpected. We were invited to house sit in Hawaii for two months. Awesome. We said yes, and bought plane tickets. Then, thru no fault of their own, our friends’ plans changed and they had to push back a few weeks. Surprise. But we had already committed our apartment to some other friends. We decided to hit the road. This would let us spend Easter with our college girls and do some Spring climbing in Yosemite before flying from San Francisco to Hawaii. Surprise. We drove across country, enjoyed a wonderful visit with Karina and Alison, and pressed on to California. Next stop: Yosemite. We’d traveled 3,400 miles. With less than a 100 miles to go, we got word: Yosemite Valley was closed. It was getting some of its biggest rain in decades and was being evacuated. Surprise. Good spirits despite the set-backs. dinner at jack-in-the-box didn't hurt. We pulled over and told all the kids to take out their ear buds. After a fast food meal, a couple phones calls, and a few recommendations from Facebook friends, we decided to make a U-turn. We back-tracked 5 hours of driving to Joshua Tree National Park, so we could camp somewhere dry. We limped in at 3am, and all the campsites were full. Surprise. We crashed for the night at a Motel 6 one town over. That day we set an Orton record for hours driven in one day: 16. None of us want to do that again, ever. The next morning we checked a campground we hadn’t heard of before. Ranger Amanda told us they were booked. Bummer. Then Ranger Damon returned back from his rounds. We happened to still be standing at the counter as he walked in. Turns out there was one site for the exact two nights we needed. We took it, and it was a beautiful: abutting the desert, with a big rock formation for primo privacy. Surprise. 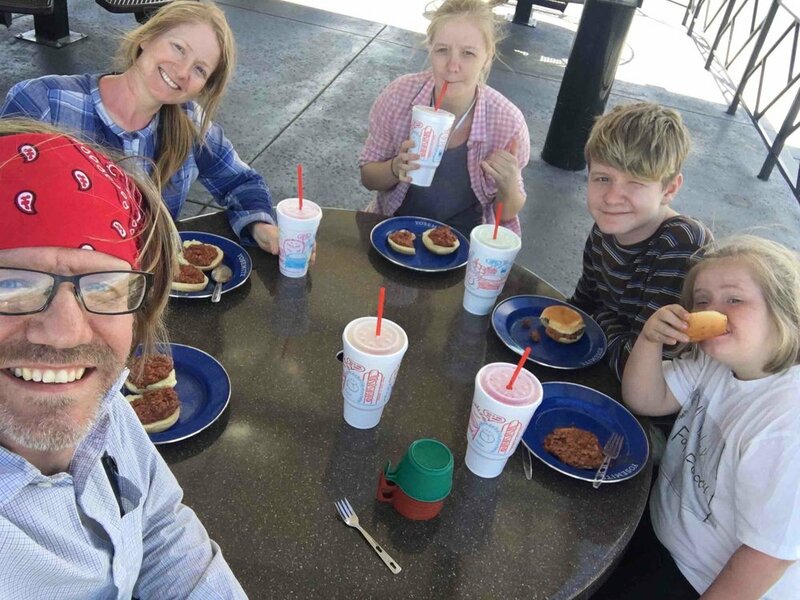 We ate well, made new friends, rock climbed, got slushies at Sonic (oh, man!) and got sunburned. Three days later we shoved off for Yosemite. As Yvon Choinard, founder of Patagonia, says, "It’s not an adventure until something goes wrong." In my case, if some things hadn’t “gone wrong” most of the opportunities I’m enjoying right now never would have surfaced. I wouldn’t have spent Easter with my daughters. I wouldn’t have camped in the beautiful desert. I wouldn’t be back in majestic Yosemite. My word for this year is: limber. I want to stay limber, because if I grip and cling too tightly to what I expect to happen, I’ll exhaust myself, get frustrated and miss out on all the unexpected opportunities hidden behind what I might consider bad news. Limber lets me enjoy the unexpected. I’m preparing to be surprised. Stay limber, my friend. Sunset at Joshua Tree. Spin off from the rain storms up north. Warming up and climbing outside again after a long winter. The road from Joshua Tree to Yosemite, as seen through our WINDSHIELD.